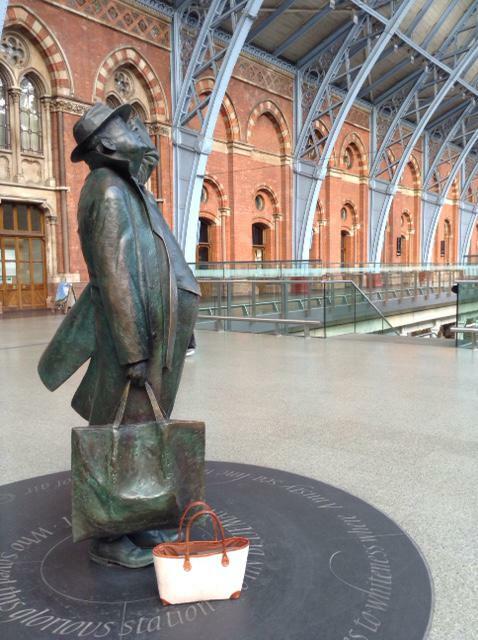 This wonderful statue (erected in 2007) of poet, writer & broadcaster Sir John Betjeman (1906-1984) stands tall and proud; we are instantly drawn to his admiring glance and topped hat as he poignantly looks upwards at the glorious, sweeping arches of the London station he fort to save, St Pancras. To think they might have demolished this beautiful structure is ‘criminal folly!’ spoke the outraged founding member of the Victorian Society (1958) and ardent defender of Victorian architecture. Betjeman’s poetry was humorous, ingrained deeply in a mid-20th century Britishness (Robertson’s marmalade, tea and tennis, angel cake, Ovaltine, bicycle gears, country lanes, buttered toast). It is alive and well in his poems but fading fondly into the quaint, misty background of a bygone British era. Who would have thought that the St Pancras Station of Victorian splendour, saved by Betjeman, would eventually become an International Station and connect us to Paris in 2 and a half hours? And why do the tourists flock to see London and Great Britain, because of our ‘quaint‘ Britishness…so let’s keep it alive! Possibilities, personality and enthusiasm… You need bags of it…if you lose faith borrow my bag!